Beaujolais is a non-serious wine, right? Gamay is an inferior grape? Well taste this, and change your mind. Yes, most Beaujolais is uninspiring, but this is an exception. It also challenges preconceptions about whether there’s anything to the ‘natural wine’ movement, because this is a wine that is unfined, unfiltered and, more significantly, has no added sulphur dioxide (the almost universally used wine preservative), and it is fantastic. It shouldn't be, but it's better than almost all, if not all, the more manipulatively produced wines I've tried from this region. Let’s begin with the presentation, which is spot on. It has a beautiful wax capsule (right), which is a real pain to remove (requires careful chipping away with a knife), but looks great. The label is elegant and stylish – noting fancy, but nicely done. The bottle looks good. On pouring, I was surprised by how dark this wine was. It’s a red/black colour. Not dense and impenetrable, but quite dark. The nose is wonderful. It shows a wonderful sweet, pure fruit character (cherries and blackberries) with a haunting complexity. Initially the fruit is supplemented by spice and some earthy notes; later I’m getting a bit of dark chocolate and herbs. On the palate, there’s a wonderful transparency. Sweet fruit is complemented by a smooth, silky tannic structure ad some spice. It’s not heavy; it’s not rich. Instead, it is elegant, soft, smooth and pure. I’m finding myself reaching for descriptors such as elegant and expressive - words you'd associate more with Chambolle-Musigny than Beaujolais. The soft texture is the best thing about this wine, and it makes you want to drink. It has no heaviness, it isn’t making an effort, it has nothing to prove. After a while longer, herb and tea elements begin to emerge. Then the bottle is empty, leaving me longing for more. It has teased my palate and left me wanting another glass. It is fantastically drinkable. Foillard is into natural wine: he’s a disciple of Jules Chauvet. 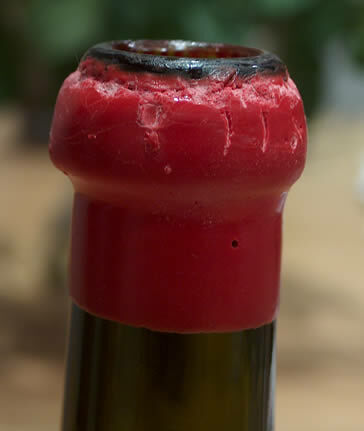 He adds nothing, not even sulphur dioxide, which almost everyone has to add to protect their wines. These old Gamay vines from the iron-rich schistous soils of the Côte du Puy are expressing themselves clearly here, or should we say they are allowing the terroir to speak. Yes, I suspect many people will drink this wine and miss the point; it doesn’t shout. But I love it. I rated it 93/100 for what it is worth. In the UK it is available for £12.75 from H & H Bancroft. For a little more information on Foillard, I recommend Andrew Jefford’s article here.